Frequently asked questions about Berkey purifying systems. Frequently asked questions about the Berkey Light system & light base. Frequently asked questions about the Berkey Sport Bottle System. Specific information about the Berkey black filter elements. Both the Black Berkey & Berkey Earth are extremely feature rich water purifiers/ filters. This video will help explain the differences between the two. The Black Berkey Purification Element Test results completed by Envirotek Labs. Berkey Earth DE Elements and general information. Information about the beneficial minerals that Berkey Systems retain in your drinking water. View our Berkey performance against the main competitor filtration systems. The Berkey shower filter flyer along with general information and specifications. General set-up information for the Crown, Imperial, Royal, Big and Travel Berkey models. Instruction manual for installing the Berkey Shower Filter system. 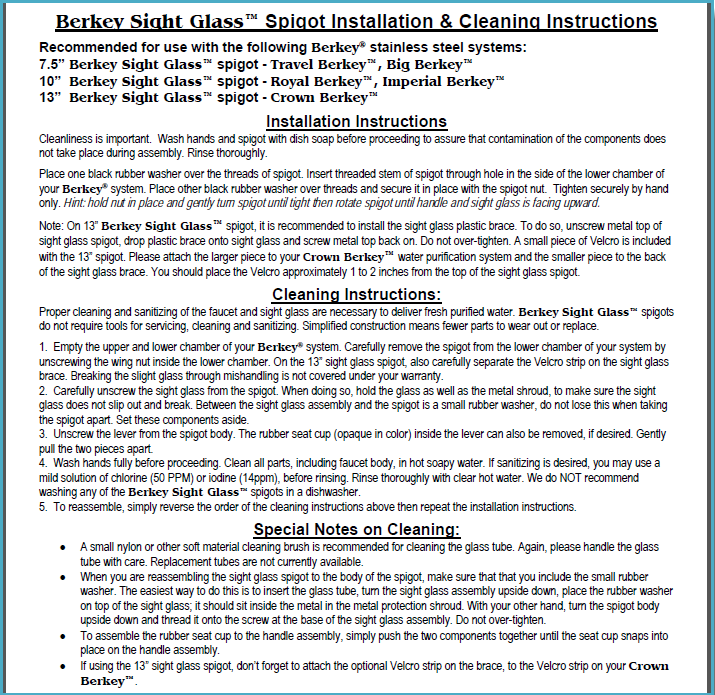 Information for installing & replacing the sight glass spigot. How to use the Black Berkey Primer tool to set-up or store the purification elements. Step-by-step instructions and operating guide. Berkey The Ultimate in Water Purification.